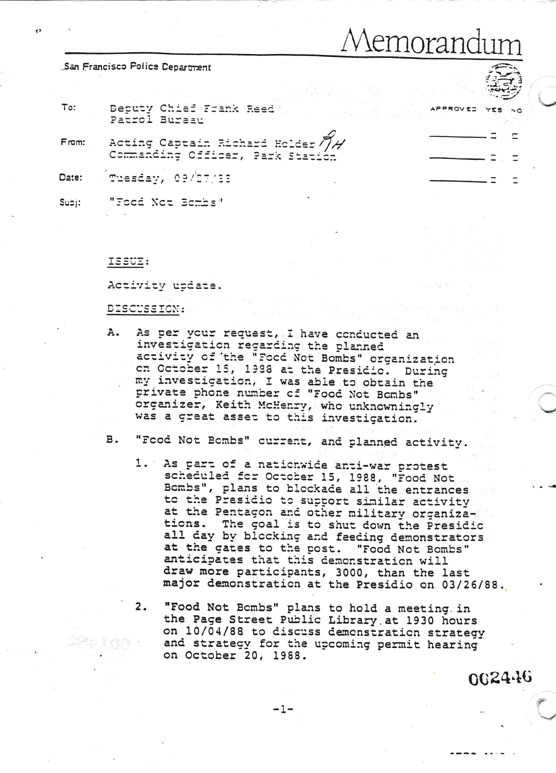 "During my investigation, I was able to obtain the private phone number of "Food Not Bombs" organizer, Keith McHenry, who unknowingly was a great asset to this investigation"
Food Not Bombs co-founder Keith McHenry called a friend in Boston on September 26, 1988 to share his excitement that the group would be sharing food at protests in three cities on the same day. An informant overheard Keith give Starhwk his home phone number at the end of a meeting in Berkeley and shared it with the Intelligence Unit of the San Francisco Police Department. The conversation was re-interpeted by the police to claim Keith was plotting to shut down the local military base. Keith was not part of the planning for the October 15, 1988 protest against the U.S. war on El Salvador. He only intended to provide food. This is just one of many examples of how surveillance is used to disrupt legal dissent in the United States.